Nomination White Enamel Flower Heart Charm 030253_40Adorn your Nomination bracelet with a floral touch with this delicate and feminine charm. 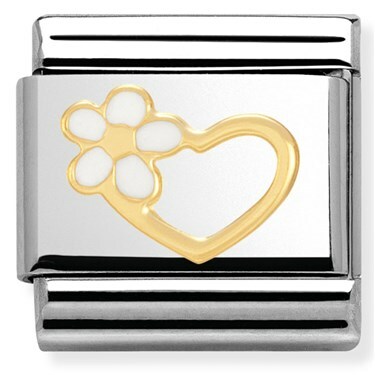 Crafted from a stainless steel base this charm features an 18 carat gold heart with a white enamel flower set on top. Collect and style your life's passions, emotions and memories with Nomination. It is nice but from pic I thought the middle was white... but it's not... doesn't show as well as I thought. Still pretty.